1. Mash a quarter of an avocado on toast for a quick breakfast or lunch. 2. 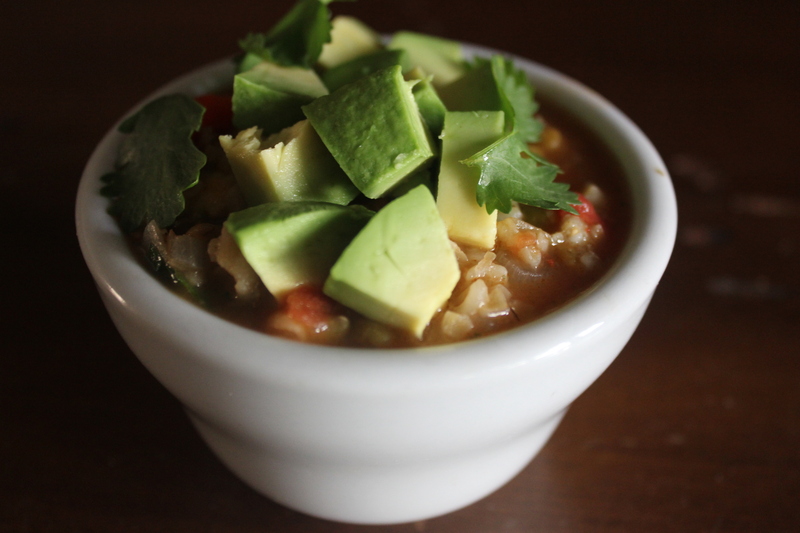 Top chili with chopped avocado and cilantro. 3. Use chopped avocado in place of tomatoes in salsa or add to a tomato based salsa, homemade or store-bought, to create a tasty dip for chips. 4. 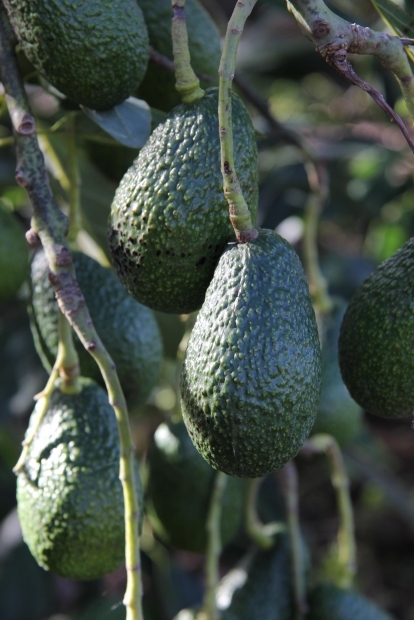 Slices of avocado taste great in sandwiches or wraps. 5. 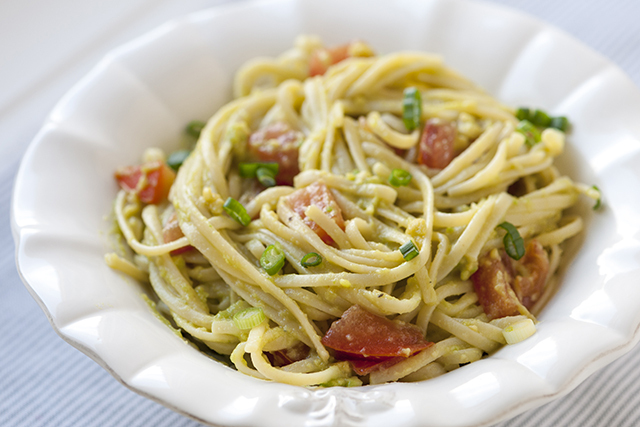 Try adding chopped or mashed avocado to pasta. I like the looks of this dish from Inspired Taste. Simple enough for a quick dinner. 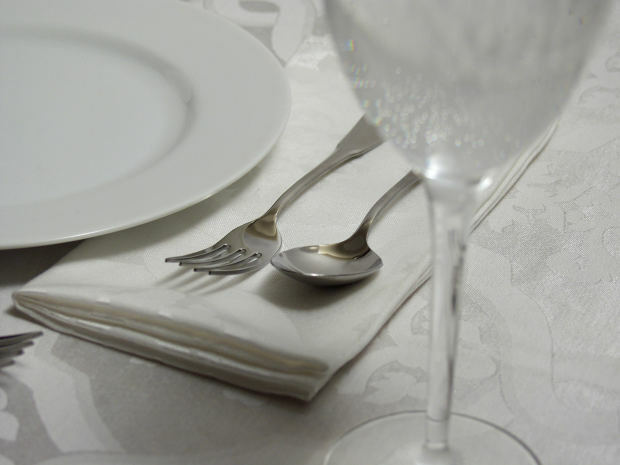 This is the photo from the Inspired Taste website. 6. 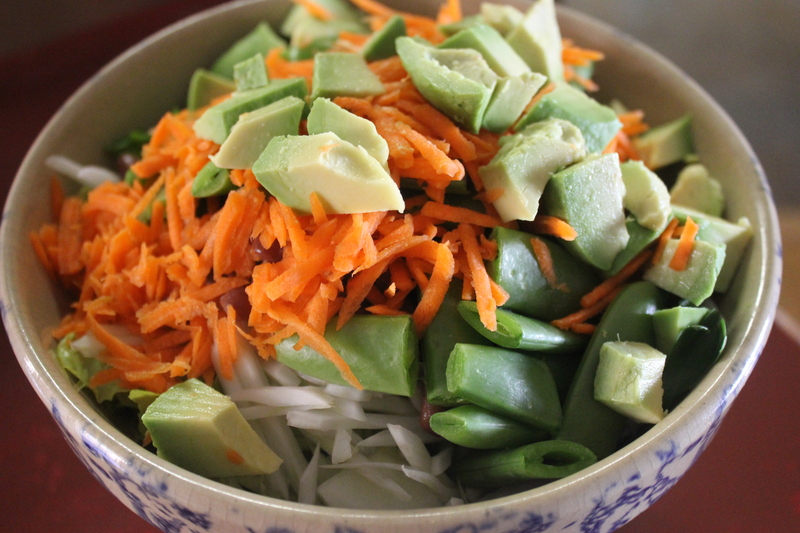 Add chopped avocado to salads–both green and grain varieties. 7. Add to eggs or omelets before cooking. 8. Coarsely mash with a lemon juice and salt as a dip for chips or crackers. Or spread on sandwiches as a healthy alternative to mayonnaise. 9. Feed it to your baby! Avocado is recommended by baby expert, Dr. Sears, as a great first food for its healthfulness and versatility. 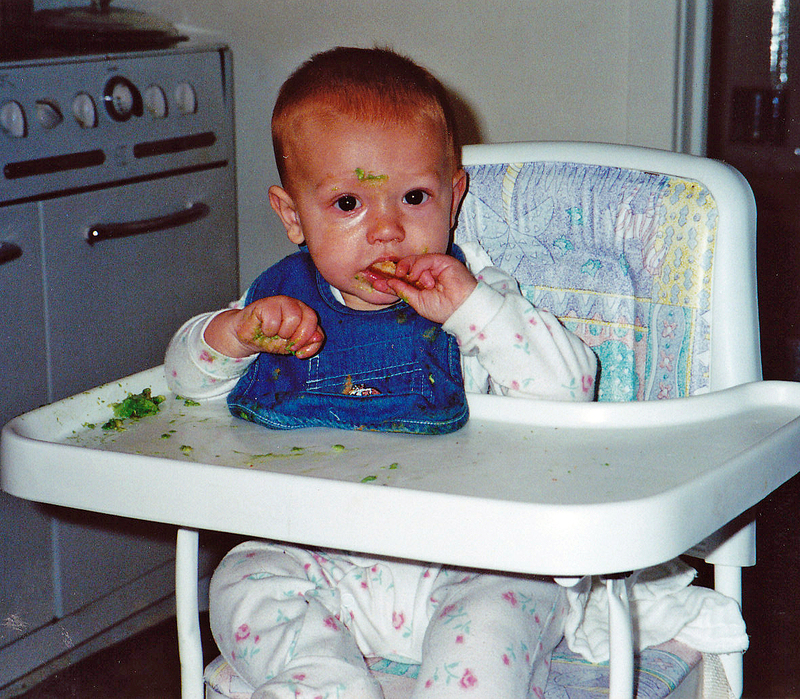 Sam enjoying his first ever avocados. 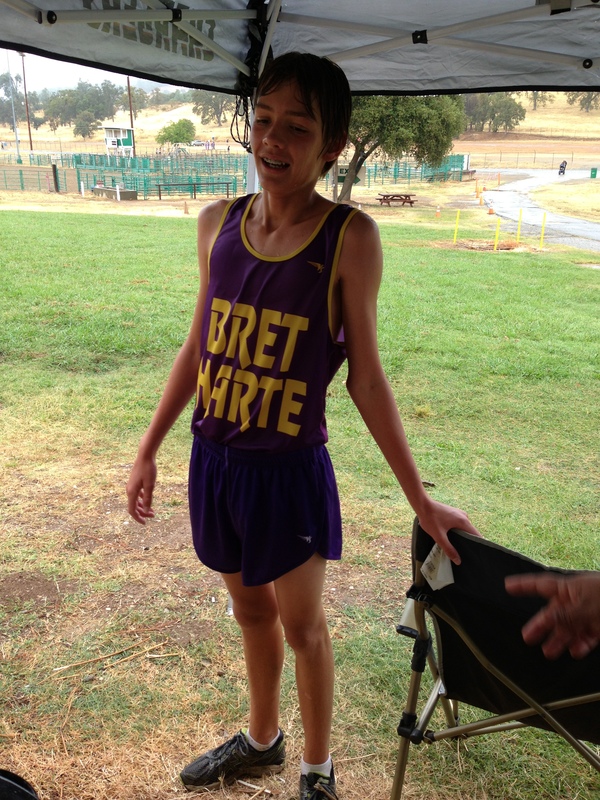 He looks good in green! 10. Make an avocado butter by mashing a ripe avocado with one tablespoon of lemon or lime juice, salt, and pepper and use a topper for a baked potato. And remember, if you find a good deal on them at the store, they can be frozen! (Best used in mashed form.) Stock up! A rare sighting of the elusive, wild avocado. Yes, they grow on trees! Several years ago, the memory is a little hazy about the when and where, we were eating a family meal at a very nice restaurant. Definitely not McDonald’s. The kind of place with candles and white tablecloths. This is an especially notable detail as I would never, in a bazillion years, ever put a white tablecloth on our own dinner table. What would be the point, after all? One use and it would never be the same. But, back to my story. 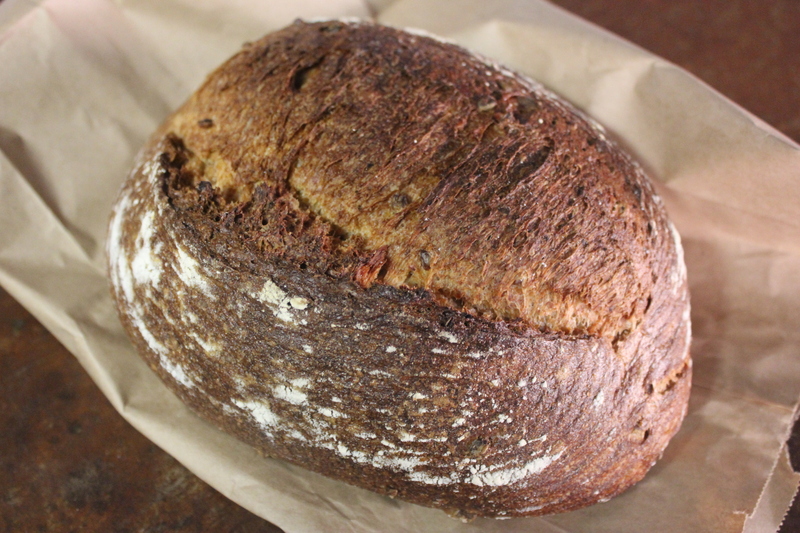 It was here, at this unlikely eatery, that we were introduced to bread and….olive oil. A small white dish with dark, fruity olive oil, a bit of aged balsamic vinegar and freshly chopped herbs. Where was the butter, Sam, the bread hound, wanted to know. There wasn’t any. A moment of unhappiness (with Jim and I wondering what insanity had brought us here with a child) until he was persuaded to dip his bread. By this time, the two adults in the party were enthusiastically dipping with abandon. And, if you haven’t already guessed, with one dip, he was hooked. 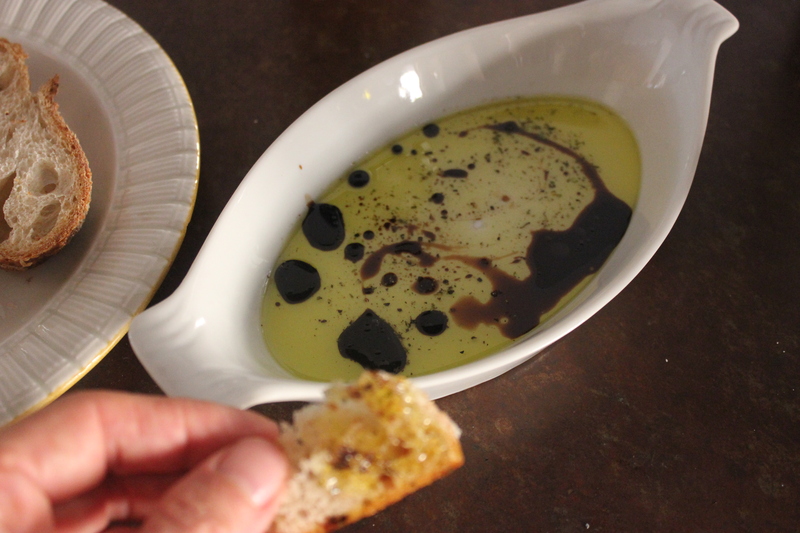 In fact, to this day, whenever we bring home a nice crusty loaf or baguette, Sam is quite ready to throw together a little dipping oil of his own for the dinner table. Here’s the recipe at it’s most basic. 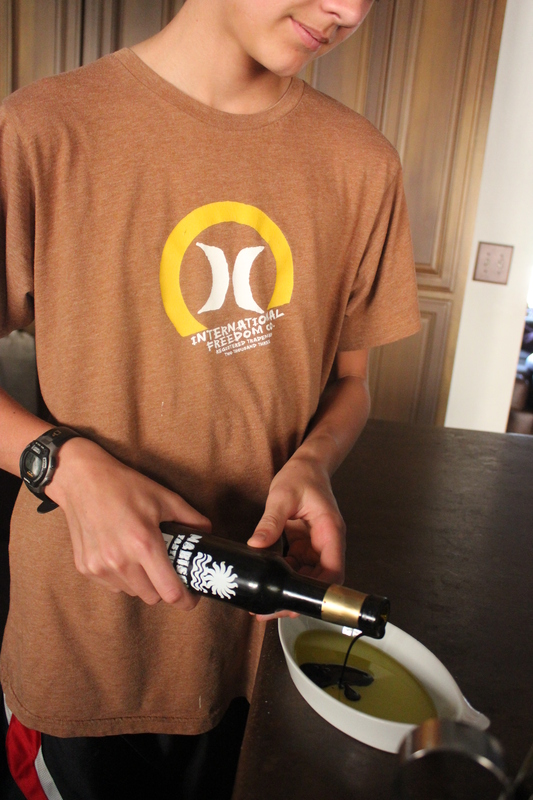 All you need is a good quality olive oil and a nice aged balsamic vinegar. Simply pour some olive oil onto a plate or shallow bowl to cover the bottom. Then pour or spoon on a tablespoon or two of balsamic vinegar. The young chef in action. And there are definitely benefits to ditching the butter. Researchers have found that consuming a Mediterranean diet heavy in olive oil can help lower some heart risks. Consuming more than four tablespoons a day can significantly lower your risk of having a heart attack, suffering from a stroke or dying of heart disease, according to the recent study published in the New England Journal of Medicine. I have many food weaknesses. Ice cream, gummy bears, white bread with lots of butter. I share this as a form of therapy. My public declaration will give me the strength to keep on the righteous path of wellness. Won’t it? 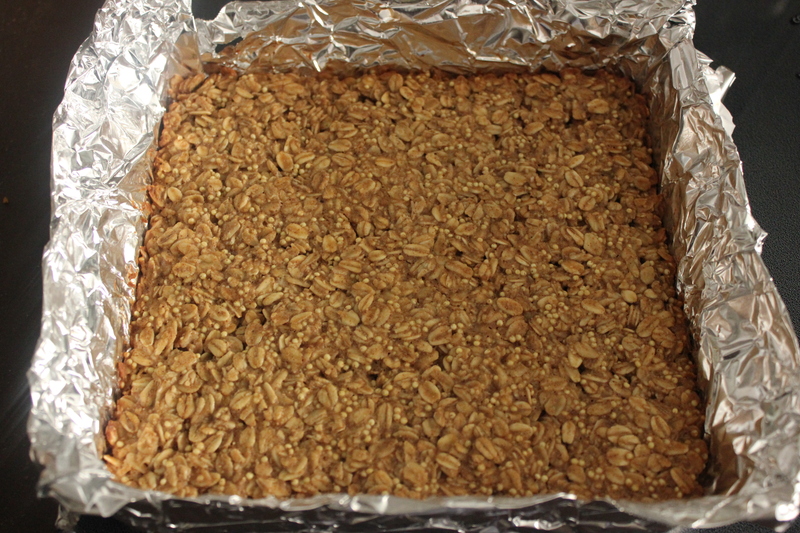 But not all of my culinary longings involve large amounts of sugar, fat and refined grains. 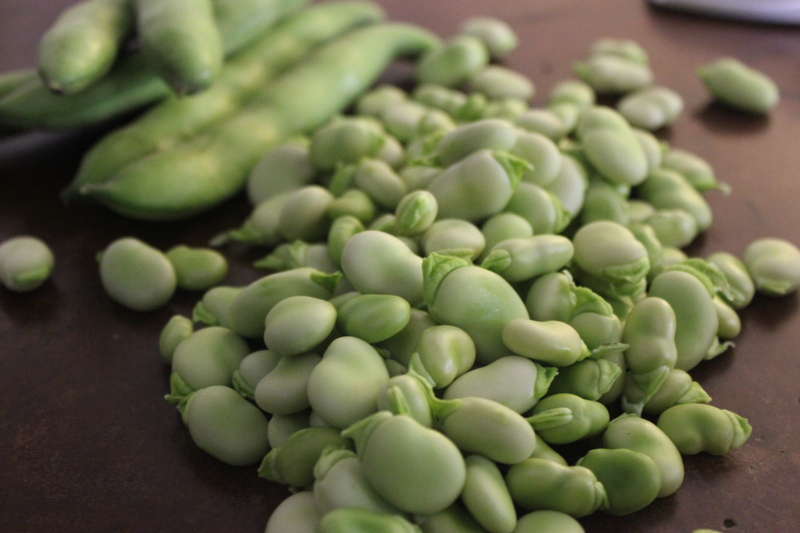 Every spring I get to indulge my nutritionally acceptable desire for….fresh fava beans! And just in time for Mediterranean Diet Month. As I understand it, they were brought to this continent thousands of years ago from countries located near and around the Mediterranean. 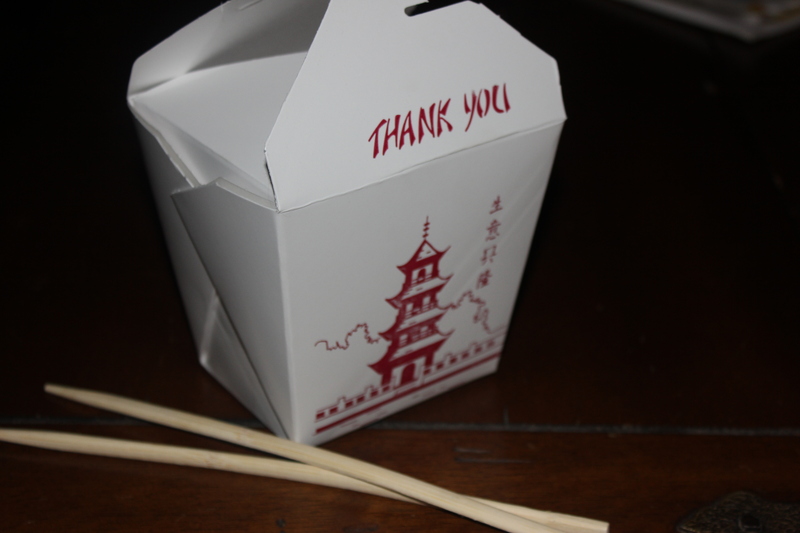 Sadly, they haven’t made great inroads into our eating consciousness. Probably because they’re, er, a little labor intensive. They actually have to be shelled and then peeled. Which is why maybe it’s a good thing that the growing season is a short one. I’m quite happy to do all the work (with help) until, quite frankly, I’ve had my fill. 1. Shell the beans in the same manner as you would peas. This happens to be a perfect job for the kids. They’ll love it, really. 2. Of course, you aren’t done yet. There’s still that second coat that has just got to come off. Some people claim that they’re fine left intact, but I wholeheartedly disagree. 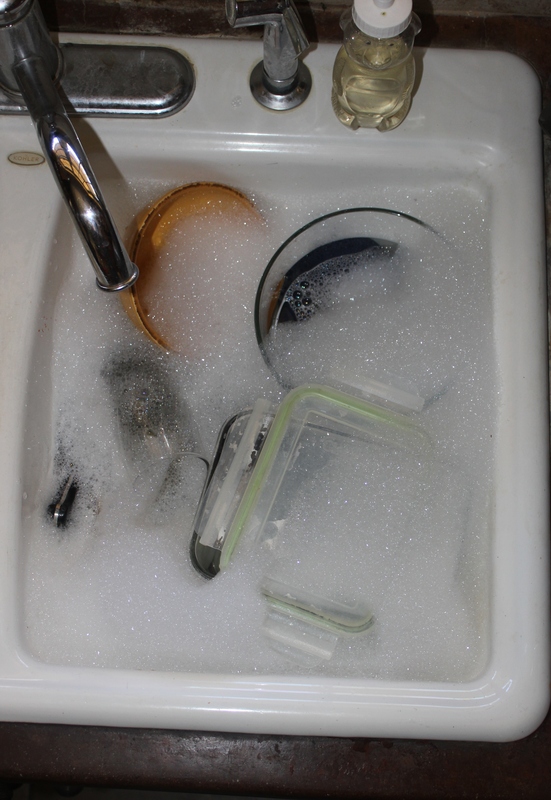 Boil a pot of salted water, and toss them in for a minute or less. Drain and let cool until you can comfortably handle them. Parboiled and wrinkly skinned. Ready to peel. 3. The next job is for adults or older kids with good motor skills. You must delicately pinch a hole in the light outer skin before popping out the fava bean with your fingers. It’s actually not that hard but, again, time-consuming. Better yet, do it with your kids as you talk over their day. Family bonding time. At this point, they’re ready for anything. I feel about fava beans the same way I do about strawberries. They’re so delicious I only want to eat them plain–without a lot of adornment. This means I usually just saute them in a skillet with a little olive oil, salt and pepper. Just long enough to ensure that they are tender throughout. 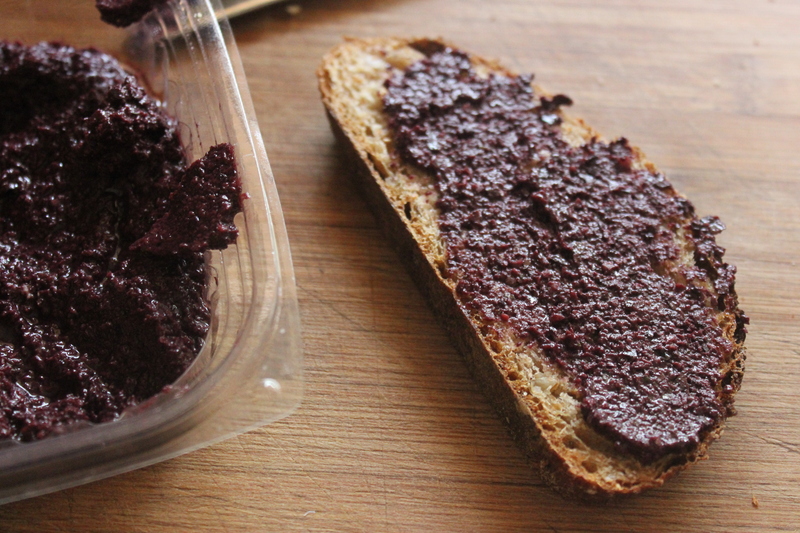 I toasted slices of whole wheat sourdough and spread on a thin schmear of olive tapenade. Next came a slightly thicker schmear of hummus (yes, we’re embracing the Mediterranean theme) followed by a generous sprinkling of the pan cooked favas and fresh ground pepper. 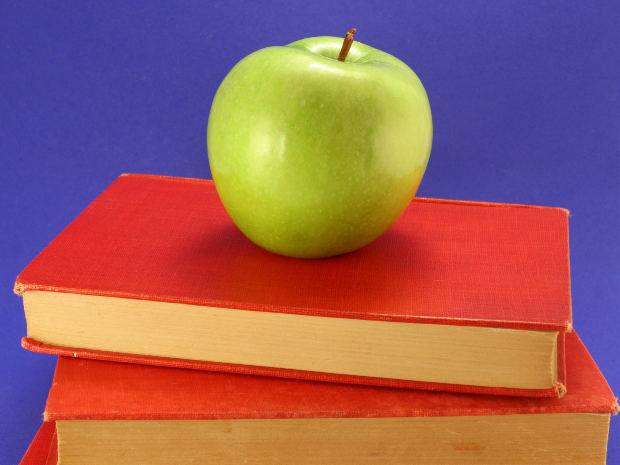 If you’re looking for more ideas, here are a few good ones. Cold Sesame Soba Noodle and Fava Bean Salad from Food52. 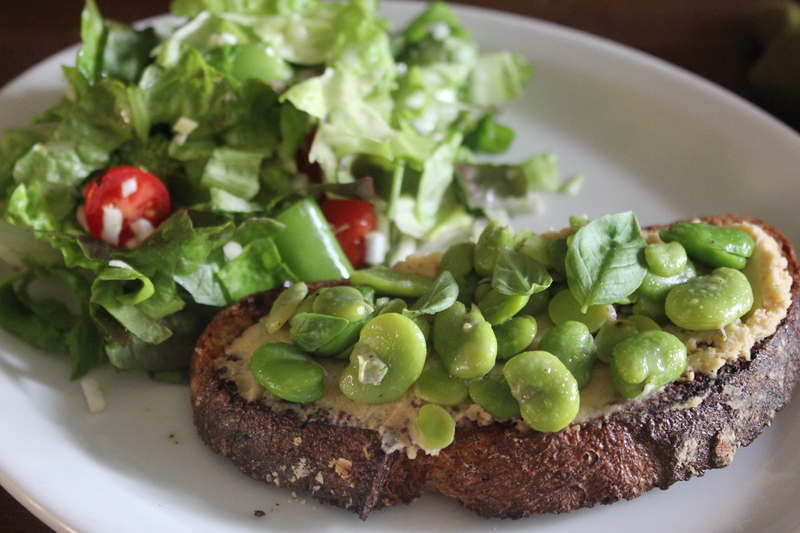 Fava Bean and Radish Bruschetta from the Kitchn. Grilled Fava Beans from 101 Cookbooks. Remember a little hard work never did anybody harm. 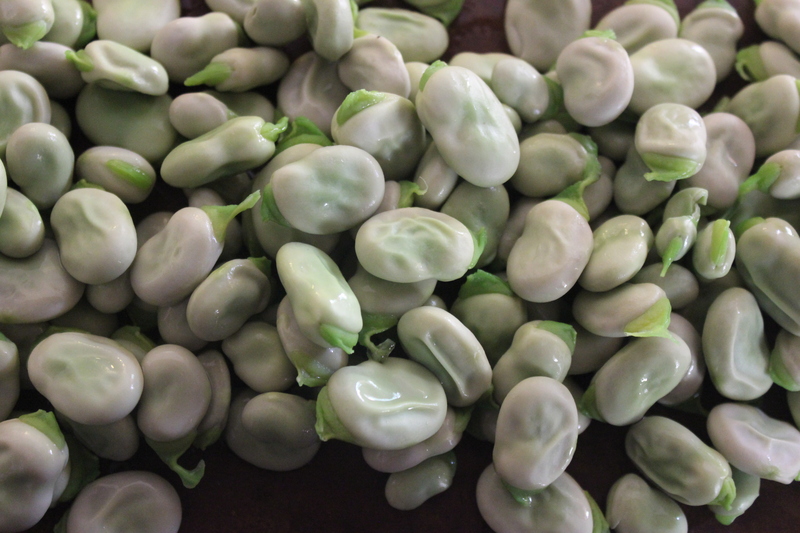 And since favas are a good source of fiber, protein, phosphorous and folate, they will only do good things for your body. Enjoy some this season! For thousands of years, the people who lived along the Mediterranean coastline have been eating one of the healthiest diets on the planet–one rich in plant foods and healthy fats. This includes the ancient Egyptians who feasted on plenty of the same tasty foodstuffs that we eat today–including hummus, a popular dip, both then and now, made from garbanzo beans. If you’re not familiar with it, it’s a great dip for pita or other breads as well as vegetable crudites such as carrot sticks, cauliflower florets and cucumber chips. It usually comes packaged in small plastic tubs found in the refrigerated section of just about any self-respecting grocery store. But, as with a lot of foods, it’s better homemade. It’s a lot cheaper too! A while back I cooked up a big pot of garbanzo beans. 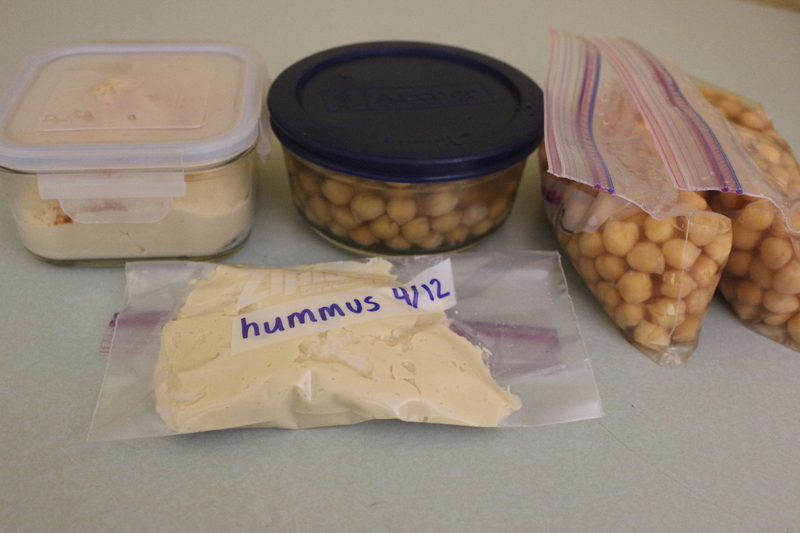 We eat a lot of hummus so I portioned these beans into bags slated for the freezer. 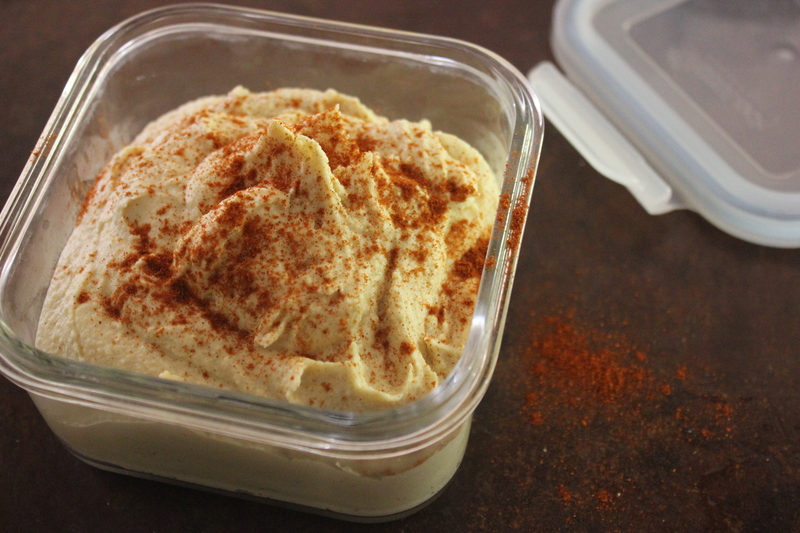 I like to have them on hand so I can whip up a batch of hummus on a whim (or a request). There are tons of recipes out there. You can easily mix it up by adding other ingredients such as roasted red peppers, jalapenos, roasted garlic or olives. Place all ingredients, except paprika, in a blender or food processor. Blend until smooth. Add additional water by the tablespoonful if needed until hummus is easy to spread and dip. Sprinkle paprika generously over the top. 1. Add them to salads. 2. Make soup. Try this very simple Marcella Hazan recipe for a traditional Italian soup. 3. Use as a vegetarian sandwich spread. Hummus. 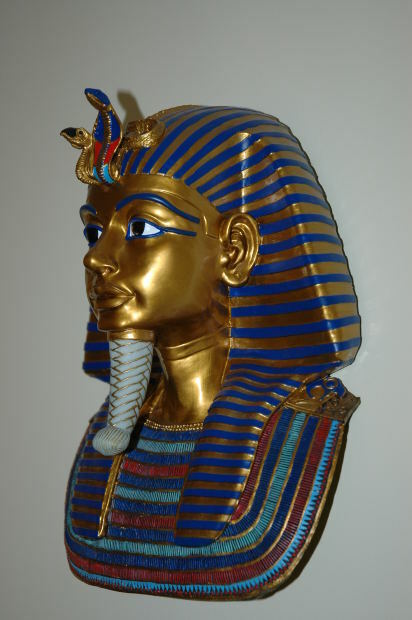 Fit for a Pharaoh!